← The Sky-Watcher Esprit-ED100 quintuplet refractor – a real cat amongst the pigeons! When I take a set of sub-exposures of something moving or changing in time I think of creating an animation. 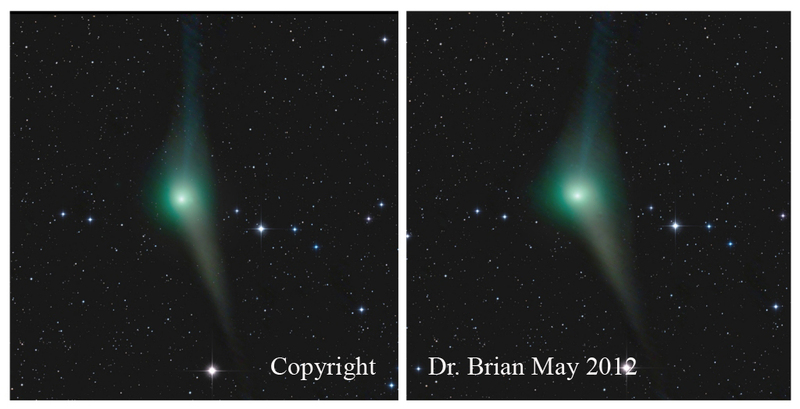 When Dr. Brian May (yes the Queen guitarist) sees a set of sub-exposures with a moving comet and a stationary starry background he thinks of stereograms 🙂 Brian created this totally amazing stereo photograph of comet Garradd using a couple of my time-separated sub-exposures taken recently. A beautiful piece of work Brian! Print out the stereogram and view through Brian’s OWL viewer (or an old Weetabix viewer if you have one) or you could even use the “free-view”, or cross-eye technique. I have spent most of this afternoon just staring at this image with an OWL!